Time to learn a little bit about Chinese teas. Tea has been a beverage in China as far back as 2700 BCE. It has had such an impact on life in asia that there was even a book called the Tea Classic written by Lu Yu somewhere around 764 CE which describes different teas and methods of preparations among other things. Since its discovery the drinking of tea has spread all over the world. There are many types of teas and they all have their own method of being prepared and consumed. I think that one of the reasons that most people don't like or drink tea much is that it is all treated the same and consumed in the same way. Here are some basics when it comes to preparing and consuming different types of tea. The first thing to understand is that unless it is specified all tea comes from the same plant species. The differences come in the age of the leaf when harvested, preparation of the tea before consumption and the method of consumption. Below are some basic descriptions for different types of teas and some basics on how to prepare them. We have also included some basic recepies for preparing teas. They include some that can help your health and some just taste great. Green teas are very popular in the west now since there has been a lot of press about the health benefits of consuming them. There are many types of green teas, but they all have a few things in common. Green teas are typically picked early in the season and are very young leaves. In addition, they typically have had very little fermenting, or no fermenting processes done to them. They have a light amount of caffeine when compared to coffee or black teas. Typically they can only be soaked a few times before they lose their flavor. When brewing a green tea you must remember that as they are young leaves they need to be treated with care. The temperature of the water must be between 70 - 80 degrees C. In addition, they are not to be soaked very long, just a couple of minutes or so. If the water is too hot or if they are soaked to long the tea will taste bitter and have an astringent quality in your mouth. Green teas have a cold nature and if consumed in too large a quantity can cause a stomach ache. However, this cold nature makes it nice to drink in hot weather and can actually cool you down. In the end, green teas are a great way to get into drinking tea. White teas are a newly popular tea in the west. Examples are teas like Silver Needle Tea and White Dragon Ball. Typically white teas are not or only lightly fermented. The flavors are very gentle and when held up to your nose there is often very little fragrance. When brewed the color is very light yellow or green. White teas are a good beginner tea as they are quite gentle. They should be brewed much like green teas at a temperature of 70-80 degrees C for 1-2 minutes per soak. 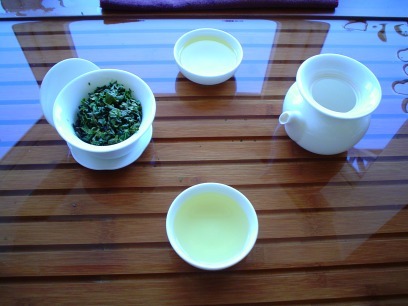 Oolong teas, sometimes written as wulong, are another very big category of Chinese teas. Oolong teas are partially fermented teas and as a result they tend to have more caffeine than green teas. The flavors tend to be a little stronger than green teas and the aroma will often be one of flowers and tea together. Typically an oolong tea can be soaked several more times than a green tea and still have a nice flavor. When brewing an oolong the water needs to be hotter than for a green, 80-90 degrees C is a good range. Soaking will need to range from 1-3 minutes depending on the strength of the tea that you enjoy. Much like green teas, if they are soaked too long or the water is too hot they will have a bitter or astringent flavor. What we call black teas in the west are actually called red teas in China. Most westerners in Europe and North America consume black teas. In the US it is usually in the form of Earl Grey or Iced Tea. Black teas are fully fermented so they have the strongest flavors and highest amounts of caffeine. While called black teas the color of the tea is actually a brown, red, or even green color. The flavors are very strong and even sharp, this is why other flavors, milk, sugar, fruits, spices, and herbs are often added to black teas. Black teas are usually prepared at a higher temperature, 80-90 degrees C, and soaked for a longer time. Pu Er teas are relatively unknown in the west. They are usually very dark and strong in flavor. Unlike most other teas where the fresher teas are the better teas, pu ers are actually worth more as they age and the flavor improves with age. This tea is attributed to the famous military strategist Zhuge Liang who, 1700 years ago, encouraged the people of Yunnan to cultivate tea as a way of raising money. The highest quality pu ers are harvested from ancient trees and the leaves tend to be large. Pu Er teas are generally sold in bricks and can come in a variety of flavors. They can also come in many different price ranges. I have personally had a pot of pu er, given to me while in China, that was worth about $500! However, you can get great pu ers for much less money. More and more research and stories are coming out of the health benefits of drinking pu er. This type of tea is very popular in China for female reproductive health. In addition, for coffee drinkers, pu er is a nice door into the world of tea because of its rich flavor. It tends to have a rich earthy flavor. Pu er teas are thought to benefit the liver and spleen. In addition pu er tea is known to help lower cholesterol, break down fat, remove toxins, inhibit cancer cell growth, enhance circulation, decrease inflammation, and improve female reproductive health. They contain caffeine, catechins, polyphenols, and theanin. Try drinking your pu er by rinsing it first for a few seconds in 208 degree water, it is aged and can be dusty, then steep it for a minute or two, depending on how strong you like it, and pour it into a gathering pot. You can continue to steep the same pot 6-8 times and you will notice the flavor changing each steeping. The last category to mention here are herb and flower teas. While not actually teas, they are often very enjoyable. The nice thing about this grouping is that it is very broad so there are a lot of choices and they will usually not have caffeine unless mixed with a tea from another group. In China a very popular flower tea is chrysanthemum tea, sometimes drank alone and sometimes with pu er. Roses are also very popular. In the west camomile is also popular. Another nice quality of these teas is that often they have medicinal properties as well.